While we are on the subject of aprons…. Here is another pattern I picked up, but not at Hobby Lobby. I stumbled on it while at Uhm, cough, Wal-Mart. Yeah, yeah yeah, what can I say. Sure I can sit at JoAnns and sit through looking through books of patterns but I’m on limited time. This one just popped out at me on one of their racks. I do have other patterns I purchased but dang, this one is sooooo easy. Maybe that’s why Simplicity came up with “Its So Easy”. The other thing when Hobby Lobby has their patterns on sale the it’s so easy is NOT 99 cents, they stay at the 6 dollar price. Remember I used to work there. Oh yeah I quit my day job to pursue my dream. Anyways this pattern at Walmart was under two bucks. You can’t go wrong can you. Pattern number A8120. Comes in 3 sizes and a little girls pattern too! The thing I like about this pattern is that it has a big pocket for the front and then the back that creates that big pocket. Then the waist band. Did I tell you I really don’t look at the instructions? I just look and toss to the side. Maybe because I’m a seasoned sewer. Basically the biggest part is making the waistband. 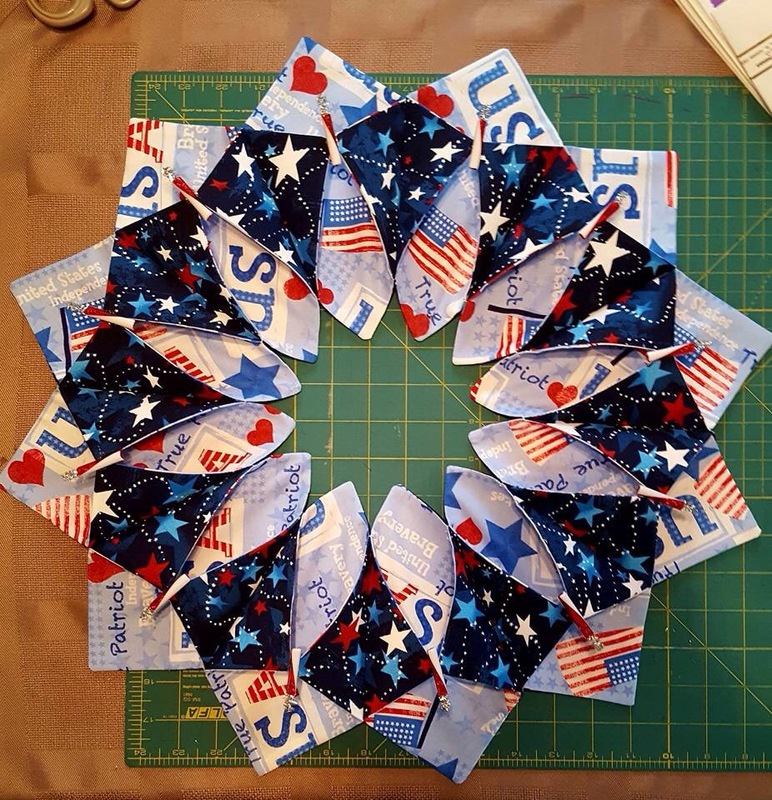 The fast and easy is attaching the bias tape to the pocket edges and the edges to the two main pattern pieces. 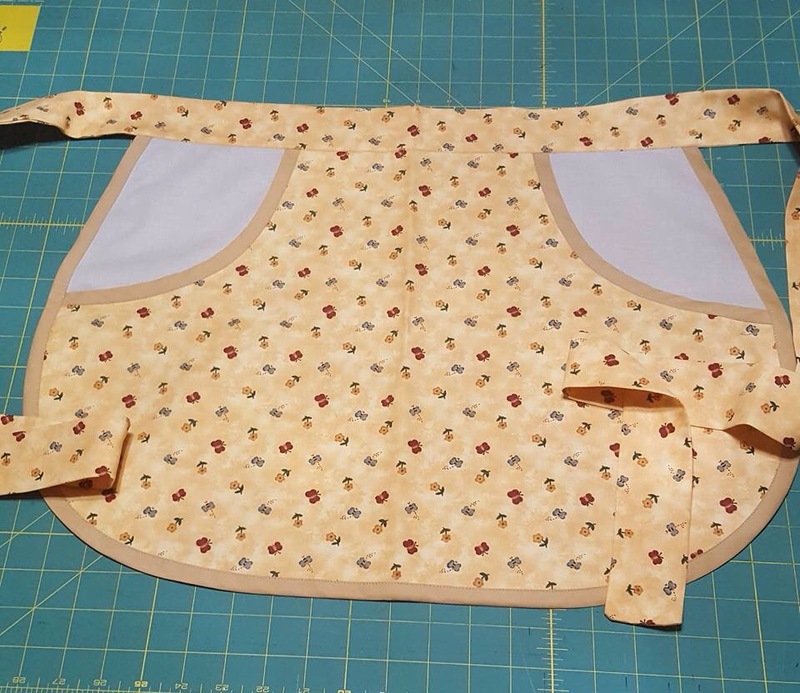 Most of the aprons I am making are 14-16, however I’m an 18 and these fit me. Only takes less than 7/8th of fabric, but if you know how to lay the pattern you can use less. Even when I am short on fabric for the waistband, I know how to improvise. I even make the straps longer. 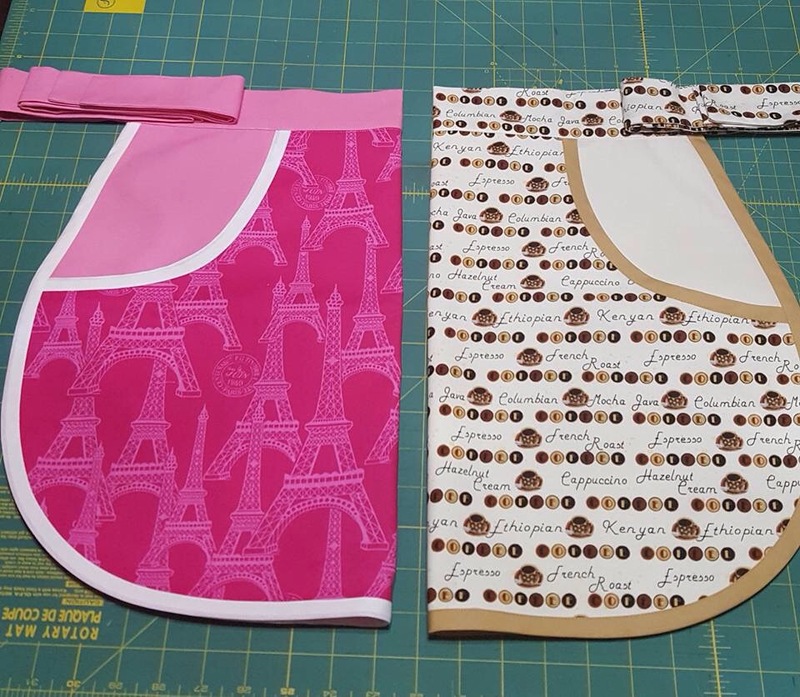 When I did the first set of aprons I asked my daughter, pattern says use contrasting fabric for waistband. I said don’t you think the same fabric as the pocket looks better?she said visual mom, visual, lol. Yes she is like me. Grabbed the fabric laid it and she said yup you got it. Don’t use the plain stuff. On the pink Eiffel Tower, ran out of fabric and bought it last year so I had to opt for plain. But heck it looks great! Here are the first ones completed, 4 more to finish, but heck I’m not done making these. 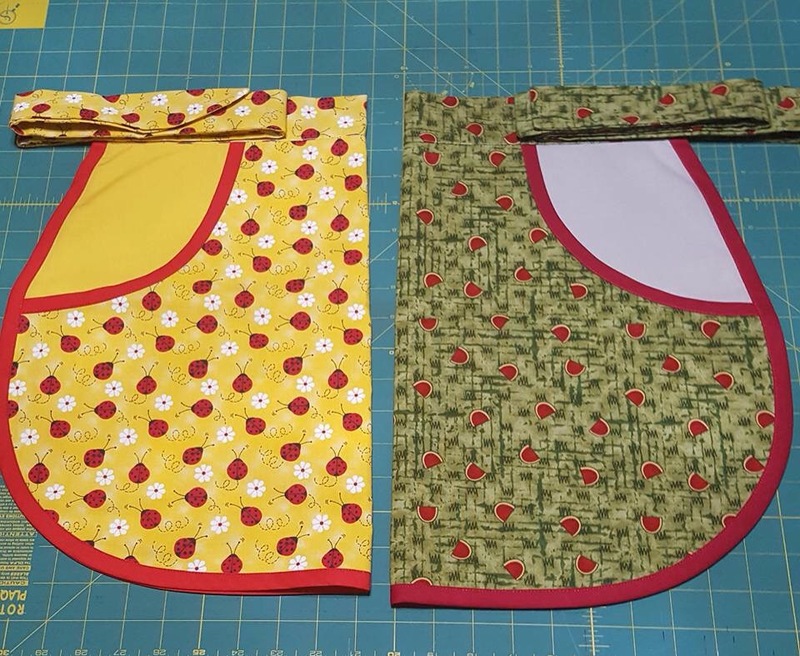 I have a lot of polka dot fabric to make a lot of these “retro style half aprons”! The gal at the new location saw photos of these and she said these are a must. Am I having fun yet? I think so. ENJOY and like and share!! This year I have been busy making fold n stitch wreaths. 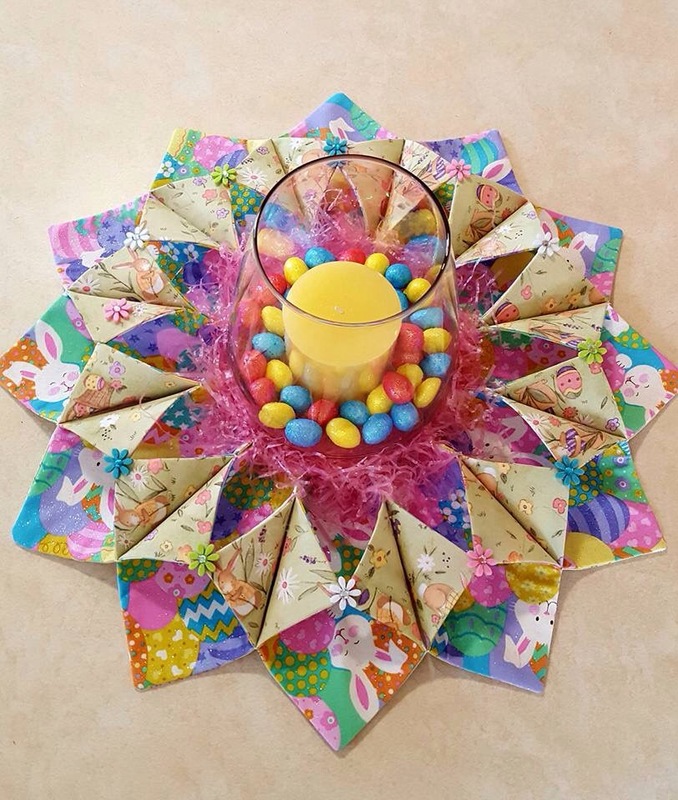 Selling them as centerpiece for tables for the different holiday seasons. You can buy the pattern however I just looked at pictures and figured it out, so please do not ask who makes the pattern and directions. There are several YouTube on how to make. Just to let you know it is a long process however when completed they look great. You can make them for wall hangings as well, I need to look into this. 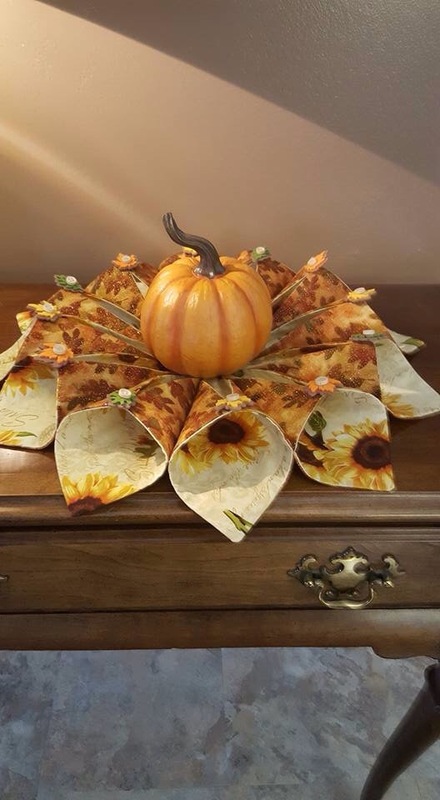 I continue to make these as a friend of mine is a manager at a fast food chain and she requested me to make them for each season for their display for their catering side. 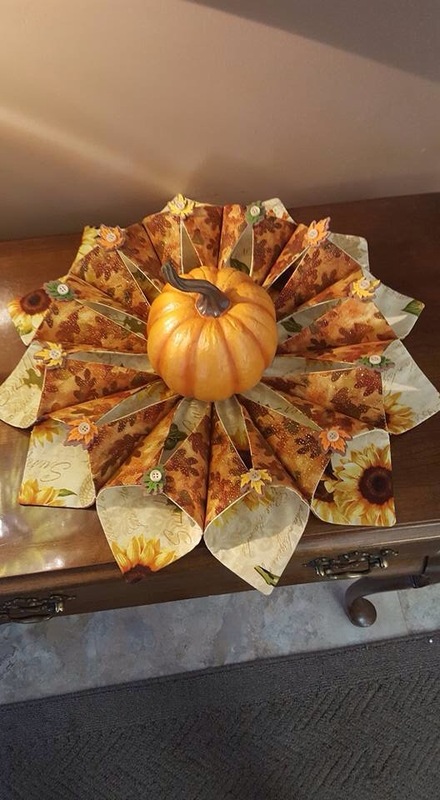 Just finished making my first fall one. Yes a few more to make in different fabrics, then on to Christmas. Yes I have to be ahead of the seasons for a reason. 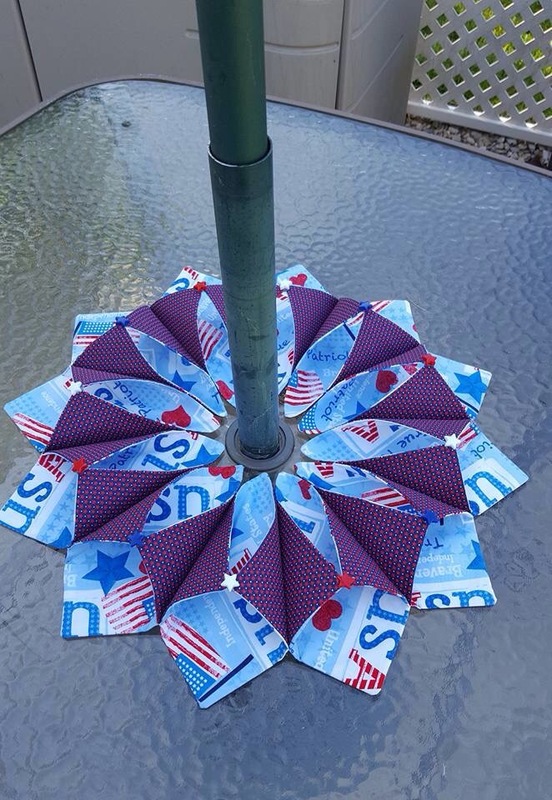 Hope you like and notice on the 4th of July one you can actually put on your patio table and put the wreath where the umbrella goes. It’s been awhile since I posted and please “like or pin” on Pinterest! Thanks for viewing, more posts coming…. A friend of mine contacted me Monday morning regarding my clutch purses. She was looking for a birthday gift that she needed by Saturday. She saw one of the clutches she liked, wanted to know price and if I still had fabric. Of course, silly question right ladies. So the only worry was getting it by Saturday. After running around like a chicken with its tail feathers gone doing errands I finally get home to start the project. Here I will tell you how to make a cosmetic bag, complete with pictures. You will notice that I was so into getting this custom order done, I actually sewed up the things not realizing I didn’t take a snap shot. Pick your fabrics. Usually these cosmetic bags are 10 x 10, but I go 10 x something. Iron the heavy weight fuse able interfacing to the main fabric. You will be using a zipper larger than 10 inches. Now to the machine. 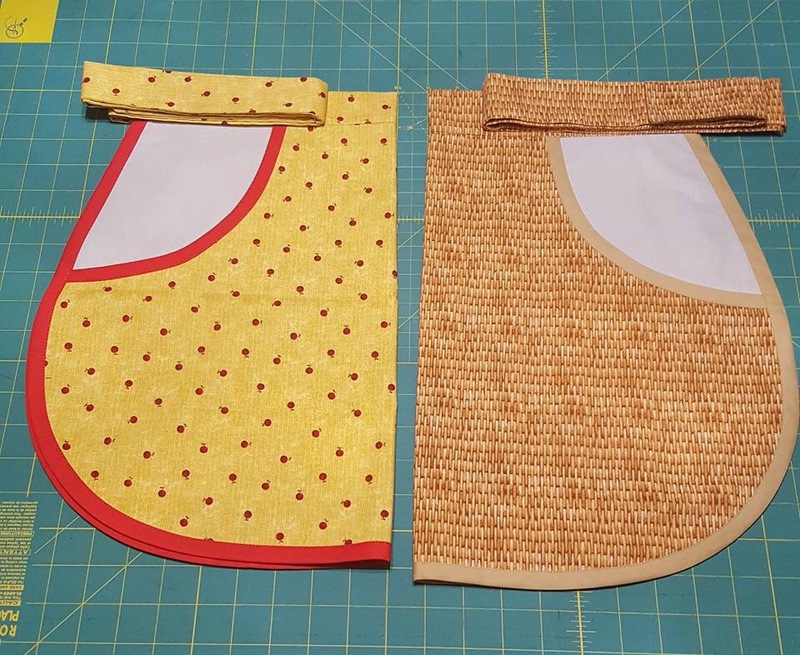 Place the lining and fabric back to back, placing the zipper on top of the main fabric with the zipper pull down. Since you will be using a zipper larger than 10 inches, you do not center it, just let the extra hang on both the top. Eventually you will be cutting the extra off. Then using your zipper foot, sew together. I used quilting clamps to hold the items in place to get a even straight stitch, not shown. After you have sewn the zipper on, then fold the fabric over to top stitch. I used YKK zipper and was able to use my regular presser foot to do the top stitch. There all done, now to do the other side. Fold the other side with the lining on the outside, main fabric on the inside. Make sure all edges match up, even the raw edges to the best you can. You then change back to your zipper foot and sew. Oops guess what, I forgot a picture on how to top stitch the other side. You need to open the zipper all the way in order to fold the fabric and top stitch. Its a tight fit but can be done. Again I switched back to my presser foot and my top stitch was 3.5. Now you have your zipper done. (I will update with a picture next time I do another one of these cosmetic bags.) NOTE: See how the ends of the zipper hang over the fabric. Now you sew the raw edges together, zipper in the “center” of the bag. Starting with the bottom first. What I do after I do a straight stitch I do a zig-zag next to the straight stitch, if you have a serger, you can use that as well. Being that I don’t serger the seam I cut close to the zig-zag. Now you are ready to do the top. When you do the top, make sure you open the zipper. You don’t want to sew the top of the zipper where the pull is because the pull has to be INSIDE the bag. Also you need a pull on the outside, I use a ribbon and place it in the center of the zipper (see picture #3). 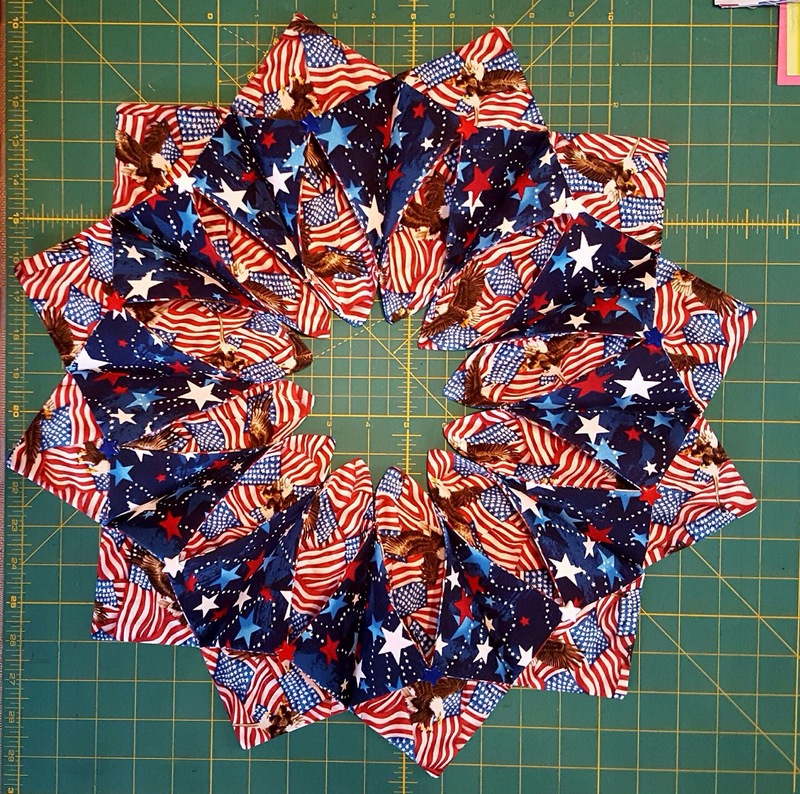 The ribbon is 3 1/2 and folded in half. Now that you have completed the top of the cosmetic bag, again zig-zag or serger the top. You are now ready to do the box corners. You will be doing all 4 corners. Fold the corners and match the seam with the fold in the fabric. Take your ruler and measure 1 1/2 from the tip. Mark with a marker tool, then sew. Again you can serger that seam, but I just used a pinking shear to cut off the extra. Now you are ready to turn your cosmetic bag right side out. Looks great doesn’t it. And my friend had her bags in not time! In the photo below you can see the size of the clutch bag compared to the cosmetic bag which is 10 x 16 but finished size is 6 x 5 x 3. 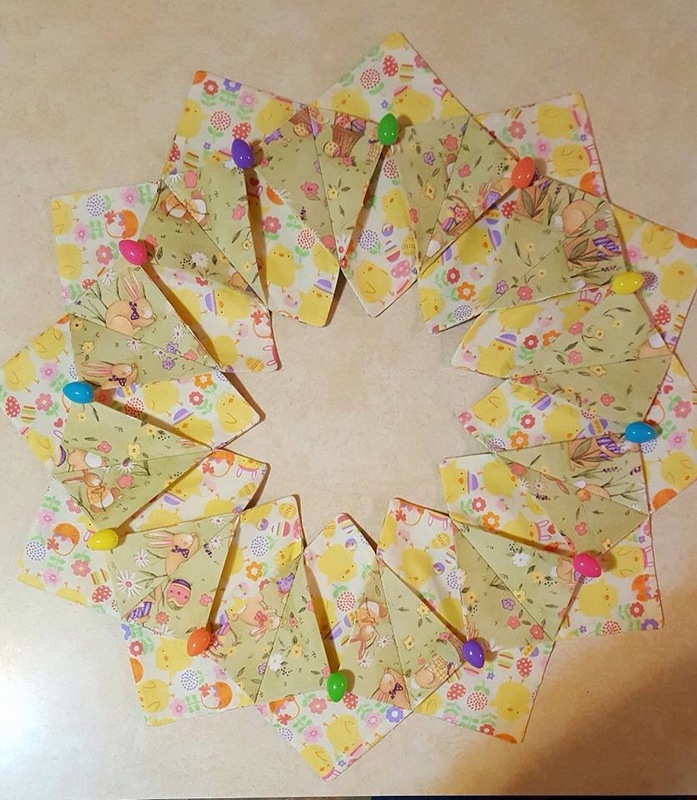 After making all those triangle pouches I ran out of zippers. I have 2 days off of work what am I going to do now! I ran into this easy and quick purse clutch several years ago. I’ve kept the pattern and have it on a brown paper bag. I’ve even made it a tad larger to make the clutch a nicer size. I have made the smaller version and might go back to making more of them. They were the perfect size to put a check book, pens and other important papers in my purse. I even used it for throwing make up and other essentials in it so I wasn’t searching at the bottom of my purse. When I have googled youTube items and it says make this or that in 30 minutes, I sit there and say yeah right. But yes you can figure 30 minutes for these, but again, that is just sewing time. All you need is lining, main fabric, heavy weight fusible interfacing and this go round I used velcro. I find myself googling and checking ETSY to see if certain items are being made to see their end products as well as prices they are charging. This particular clutch, no where in site. Lucky me! So when I get down time, I’ll be getting my ETSY site back on board. I’m pricing these at $ 9.00 and smaller ones probably around $ 7.00. Last night I finally posted these on my Facebook. I like to let my friends see what I am doing because they are my inspiration and backbone. 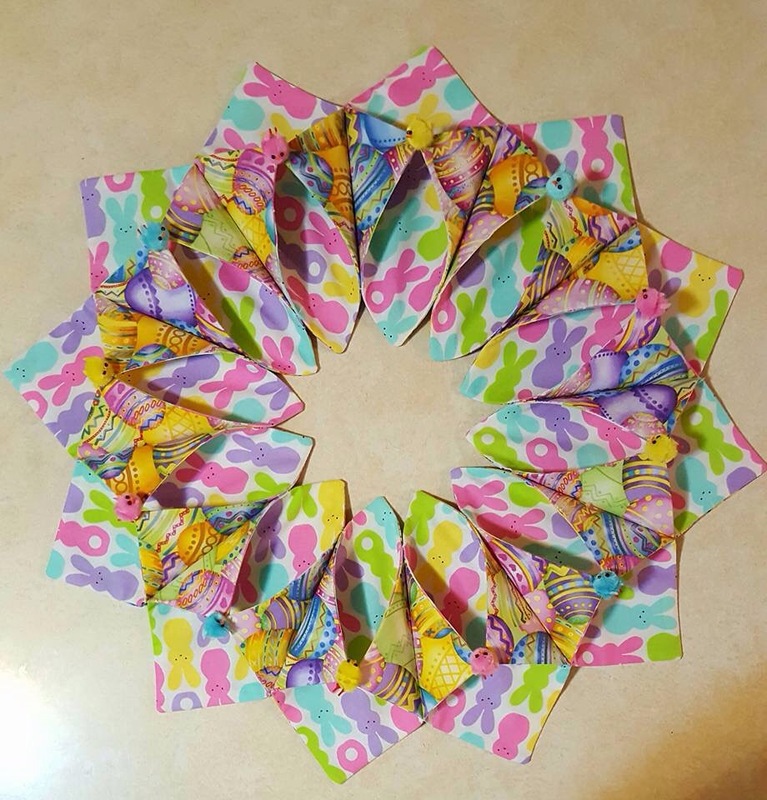 They love the items I am making and well I get comments like; you’ll have no problem selling them, being an inspiration, loving my fabric choices as well as where did I get the pattern. I probably posted the original a long time ago. So check these out and eventually I will be doing more. 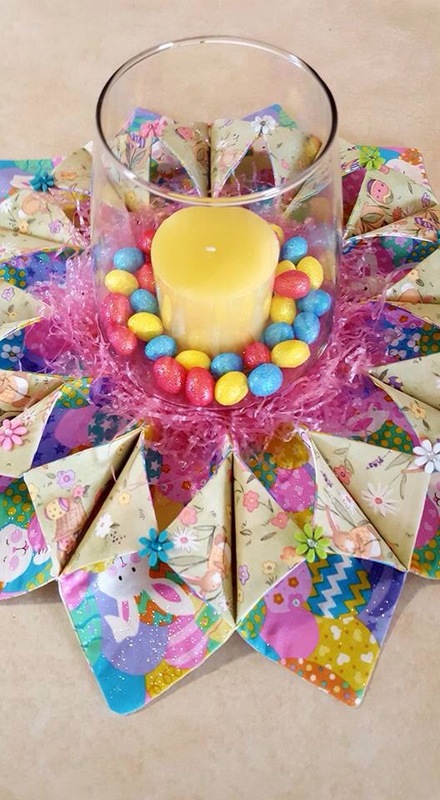 Another project using remnants! I’ve got about 9 more of these to do. I cut doubles this time around!